We would like to thank all of the shareholders who support us and believe in the company and the company’s potential long-term success. We would like to also remind everyone we are still an underfunded start up with very limited resources. Like most startups we are a risky long term investment, with the INVOcell receiving FDA clearance we have minimized some of that risk. On a positive note there are thousands of medical device companies that never get to where we are today, but we achieved that goal with a lot of hard work and some good partnerships, who like you also believe. We still have a long way to go to build INVO Bioscience into global brand and we are doing that step by step. We are a long term investment, which means we are building for the future not the stock price today or next week. If you are not a long term investor then maybe you should look to diversify your portfolio and move your funds elsewhere. We still have a ways to go. We would like to take this opportunity to update you on the status and activities of the company. Since receiving FDA clearance at the end of last year, we have trained 11 IVF clinics on the INVO procedure who requested to use the INVOcell in their facilities. These include practice groups with multiple locations in California, Utah, Idaho, Arizona and Texas along with single location centers in New York and Virginia. We also have 7 clinicians with locations in Tennessee, Missouri, Illinois, South Carolina, New York and New Hampshire that are being scheduled for formal training over the coming months. Another 6 IVF clinics have recently reached out to us, and we are providing the information they requested to commit to coming on board with the INVO procedure. We continue to work with our small staff to contact, educate and train physicians to expand the use and sales of the INVOcell device. Our partner in Canada has announced the opening of a dedicated INVO center, Effortless IVF, in Calgary launching in September with two additional INVO centers opening in late 2016 and early 2017. These centers will be offering the patented INVOcell device and INVO procedure only to provide greater access to our lower cost fertility treatment. The Calgary site is running a kick-starter campaign to attract initial patients to the new location and currently over 60 patients have been screened and enrolled for the INVO procedure. This is expected to be a huge success in Canada as the health care system does not support fertility treatments. All clinics that are adopting and offering the INVOcell and INVO procedure are also adopting our mission of offering the INVO procedure at minimal pricing, approximately half of the traditional IVF price, inclusive of mild ovarian stimulation medications and less ovulation monitoring with equivalent results to IVF. We continue to assure that our mission, to treat additional patients that could not afford current costly IVF treatments, remains intact. As we stated previously, the implementation of the INVO procedure requires INVO resources as well as the resources of the physicians and their staff. The physician and laboratory staff need training before the physicians’ can begin offering the INVO procedure to assure successful cycles where good pregnancy rates are achieved. Medical Device Directive compliance (MDD compliance). We passed both audits successfully, received our new ISO 13485 certification and passed the MDD inspection for recertification of the CE mark which is currently under review. We are also adding another market and distribution channel for IVOB. We have submitted the proper regulatory paperwork to the government of Mexico, which is currently being processed. We are in the process of manufacturing additional product to assure that we have an adequate supply in our inventory. We also just completed the design to manufacture our own retention system to decrease the cost to INVO, to our customers and ultimately to the patients. The actual manufacture of the new retention system will be performed by one of our qualified suppliers. Additionally all critical suppliers were re-audited this year and successfully passed their assessment as well as potential new suppliers are in the process of evaluation. In addition to the new retention device, we are also re-designing our holding block to make it lighter, more ergonomic and less expensive to further reduce the overall cost. These cost cutting measures are being taken to stay with our mission of providing a truly low cost, highly effective reproductive treatment. As we have stated in the Shareholder updates since receiving FDA clearance our intention is to become current with our SEC filings. We have taken significant steps to get there but are not there yet as it has proven to be a much larger task than optimistically believed to be and communicated to you. These are not excuses but facts, we secured the necessary funding to allow us to complete the full audit, filing and review process through Q3 2016. When we were filing on a regular basis we used Quickbooks Enterprise software, when we lost our funding we had to use other simpler alternative systems. Upon receiving FDA clearance the decision was made to move forward with QB Enterprise as that is where all of our history was, it took a little time to find a resource and to rebuild the financials up through today. We only have 1 person with financial expertise to work on the financials and all of the requirements of the audit. As a team we have pinched in and assisted but much of the work falls on them as we have not found many people who would work for no pay! The INVO team and the auditors are focused on completing all of the steps necessary to complete the 5 year Annual Report on Form10K. We are getting close to wrapping up the audit, then moving to generate the 5 year financials, the Form 10K with quarterly supplemental information then having a legal review and finally moving to the XBRL filing format and getting the 10K filed. All steps that take time. Once that is complete we will be go right into the Q1 2016 audit and form 10Q followed up Q2 with the intention of getting Q2 filed by the August 14th deadline. No stopping just a methodical process of getting things done that must be taken care of. We have attempted to keep everyone updated when there is something to mention. We have readily answered the questions that were concerning shareholders where actual results are concerned. They were; what are the number of shares outstanding, we identified that 2 updates ago, another was revenue so in the last update we shared what those were. Since 2008 we have stated we lost money and continued to let everyone know that through 2016 we are still losing money even after cutting expenses. What we are doing is producing a required legal document that must be fully supported and verified and it is taking more time than expected. This objective is key and we are doing it as quickly as we can with the 1 resource we have. Again as we stated last time, this is a requirement for raising the additional capital needed to expand our resources to support the growth and sales of INVO to become the standard of care for infertility. We continue to have discussions with the same interested investment banks we mentioned earlier in the year to secure the long term financing we require. 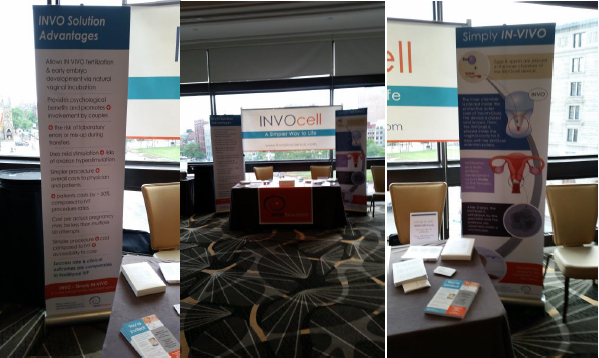 We exhibited at our first US Woman’s Health conference since achieving FDA clearance and it was a well-attended event with over 200 Boston area medical professionals and a lot of buzz about this novel device and procedure. Our booth presentation was equal to some of the much larger and well established medical companies also presenting at the conference. Based on the success of this conference we are evaluating similar conferences in the fall across the US. We have secured our first exhibition booth at the 2016 American Society of Reproductive Medicine Annual Conference in St Lake City, Utah for October, more to follow. We are taking steps to improve our website as we know if has been lacking information and content to provide a more up to date method of communication with all people interested in INVO. We will continue to send out updates and press releases as we develop relationships across the US and beyond. We thank you as we continue to take the necessary steps to build INVO Bioscience into an international reproductive medical organization. This letter to the shareholders includes forward-looking statements within the meaning of Section 27A of the Securities Act of 1933, as amended, and Section 21E of the Securities Exchange Act of 1934, as amended. The Company invokes the protections of the Private Securities Litigation Reform Act of 1995. All statements regarding our expected future financial position, results of operations, cash flows, financing plans, business strategies, products and services, competitive positions, growth opportunities, plans and objectives of management for future operations, as well as statements that include words such as “anticipate,” “if,” “believe,” “plan,” “estimate,” “expect,” “intend,” “may,” “could,” “should,” “will,” and other similar expressions are forward- looking statements. All forward- looking statements involve risks, uncertainties and contingencies, many of which are beyond our control, which may cause actual results, performance, or achievements to differ materially from anticipated results, performance, or achievements. Factors that may cause actual results to differ materially from those in the forward-looking statements include those set forth in our filings at www.sec.gov. We are under no obligation to (and expressly disclaim any such obligation to) update or alter our forward-looking statements, whether as a result of new information, future events or otherwise.